﻿Give yourself the gift of giving this year. ﻿﻿﻿﻿﻿﻿﻿﻿﻿﻿﻿December is traditionally considered a time of giving, and many of us reach for our checkbooks to donate to a worthy cause. There are other ways to give, however, not only during the holidays but throughout the year. One of the best ways is to volunteer your time. Volunteering is not free — it requires commitment, time and talent. The service you give is quite valuable; in fact, it’s been recently estimated to be worth an average of $21.79 per hour nationally. Last year, Texas Parks and Wildlife Department volunteers donated more than 978,000 hours, valued at $16.5 million. TPWD volunteers provide support to our state parks, historic sites, fish hatcheries and outreach programs, assisting TPWD in its mission. Volunteering is a “win-win” situation. It’s easy to see how TPWD benefits, but what do the volunteers get out of the experience? Volunteering is fun. It provides an opportunity to travel, meet people and develop new friendships. Volunteers serve parks across the state. 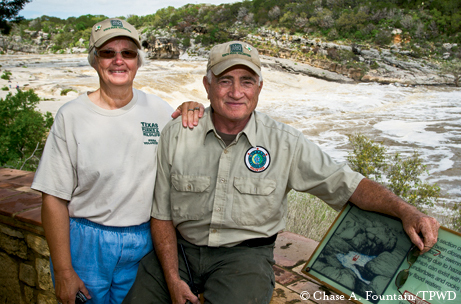 Larry and LaVonne Roszell donate their time at Pedernales Falls. Volunteering provides people an opportunity to support a cause they believe in and work cooperatively with others to solve a problem in society. It is one way for those who have received benefits from an organization to give back. Volunteers develop a sense of community and feel pride in their accomplishments. Volunteering can also provide benefits in the workforce. It is a great way to gain new skills, develop existing skills or explore different career paths. Volunteering provides an excellent opportunity to develop professional contacts and receive work experience. For those in high school and college, volunteering can be an opportunity to receive class credit or gain insight into professional opportunities. Volunteering is actually good for your overall physical and mental health, too. Volunteering produces “helper’s high,” which can reduce stress and symptoms of depression. Many who donate their time say they have healthier immune systems, experience a decrease in chronic pain and feel stronger. Perhaps one reason is an increase in physical activity. Instead of walking a treadmill, spend time volunteering at a state park doing trail maintenance or trash pickup. The TPWD volunteer program is a challenging and rewarding experience. Programs throughout the state offer a broad range of volunteer options that can be tailored to fit individual talents, experience and time frames. Volunteering is a great way to experience nature, promote conservation and outdoor recreation and share your passion. Prefer to donate money instead? Donations can be made for a specific need, such as state park operation, native wildlife and endangered species protection, freshwater and saltwater resource management, habitat preservation, hunting land access, the new game warden facility or education. However you choose to give, please visit www.tpwd.state.tx.us/involved for details. Together, we can make sure that life is better outdoors for generations to come.